Senator Raja Zafar-ul-Haq is the PML-N candidate for the Senate chairman. He was born on November 18, 1935 in Kahuta. He is a lawyer and politician by profession. He completed his M.A. in Politics from Punjab University and acquired his L.L.B. degree in 1958. He served as the general-secretary of the Pakistan Muslim League from 1963 to 1971 and was its district president from 1971 to 1981. 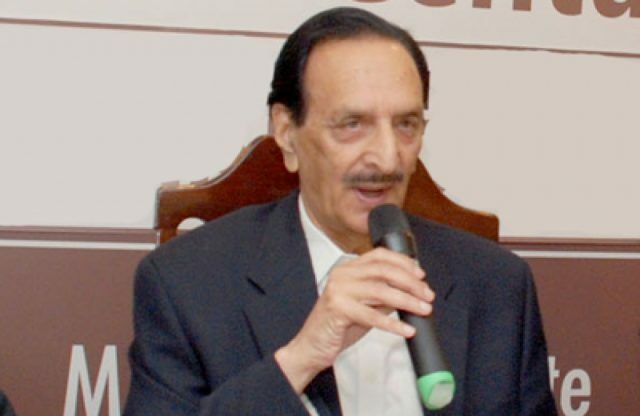 Haq served as the president of the Rawalpindi Bar Association from 1977 to 78 and was its vice chairman from 1981. The PML-N senator was on the panel of experts for Pakistan’s Law Commission. He served as information minister and religious affairs minister from 1981 to 1985. He became Pakistan’s ambassador to Egypt from 1986 to 1987. He has represented Pakistan at the United Nations, from 1990 to 1991. He was made religious affairs minister again, from 1997 to 1999. He has been elected senator in 1991, 1997, 2009 and 2015.